When I pulled up to Superior Reflections 2, it took my breath away. Waves crashing in, smell of fall leaves, and quiet I had been longing for. I walked into the cabin and was impressed with how beautiful it was, with all the modern amenities, and space enough for all I needed. Your team members were great. My sister was very grateful when you helped her out with her emergency. We went into the office looking for trail maps, and your person was very friendly. Overall, we loved it. We loved the view and the quiet! The fire place was nice, and the kitchen was well-equipped except for mugs (only 3). We took up the throw rugs since they are a danger to us seniors, and they were pretty dirty. The beds were very comfortable, and it was nice to have extra blankets and quilts available. Next time we won't have to bring our own. living room furniture was not good for relaxing. Too much table, not enough comfy seating. The loose outlets were annoying and a little scary. It was VERY hard to find the road in, especially in the dark coming home after dinner. How about asking the county for a better road sign or putting up one yourselves that a person can see sooner? Nicely remodeled. The skylights in the bedroom were a surprise - difficult to sleep in the morning. Great customer service, no need to contact anyone, everything went smoothly. Location was great, super private. We would have liked a larger tv for late night movies and better patio furniture. Cute, cozy, cabin with a great view of the lake. Everything was clean and functional. A great little getaway. We like this cabin very much. It is small but suits our needs. It is wonderful he painted in side and has beautiful flowers outside. And a wonderful view. We loved the location and how close we were located to the water. The cabin was super cute and the view was awesome. We were very Happy at Minne Me. They added a gas fireplace that made it cozy and very comfortable! When calling to add guests to our lists or ask questions, I was impressed by the friendliness and promptness of the staff. Great location! The house had everything we needed. Everything was very clean. Very satisfied with the Eagle's Nest! Absolutely perfect! A cabin feel with all the amenities perched right on the shoreline. Nice layout for both entertaining and privacy. Nice deck. Super location for lots of different activities. Easy to work with. Very accommodating. It is absolutely perfect for us. We need 3 bedrooms, which R&R has. We need space to do puzzles, which R&R has. It is right on the lake. It has a fireplace, which isn't a necessity, but is very much desired. And it is private - we aren't on top of other cabins. We need to find another place, closer to Two Harbors, that has all this. Do you have a recommendation? This about the 10th cascade rental weve used through the years and it measures up well to the others though a little less expensive. Very comfortable, compact but complete home. Dont be put off by the single bathroom. Its very spacious, double sinked and completely updated. Kitchen well planned and accessorized. Loved the big stone fireplace that functioned beautifully. Comfortable seating in living area. The view cant be beat. An earlier reviewer said the beds were too hard. Guess you cant please everyone. We found them softer than we liked so we just removed the 2 fluffy (1 foam and 1 down) extra pads to get the firm mattress that we prefer. Only criticism...they need a better can opener. My son, his wife and I stayed at Cobblestone #7 for two nights in Grand Marais. Property appeared just as advertised. Splendid! No disappointments whatever. View intoxicating! Appointed well! Have visited the North Shore innumerable times and found this location flawless. Folks had cabin at Little Marais and we lived in Duluth at one time. Located adjacent to most tourist areas by foot. Neither the pictures or the description do justice to what we found at Nordkapp! We were pleasantly surprised as we drove up and saw a stand of trees on both sides of the house. Coming from the metro area, having stayed at other larger resorts on Superior, renting a stand alone house for us was a first, and we were thrilled with the privacy! With windows and a deck off the front, the view was incredible! We had coffee each morning on the small lower deck as we watched the sunrise. At night, we stood on the deck and saw a blanket of stars one can only see from a vantage point like the one we had at Nordkapp! We loved the cabin-like interior and feel with the knotty pine and woodstove, complete with lighting that created the perfect cozy setting after hiking all day. From a cheese grater to a bottle opener to a keurig, all the necessities were there. Throw in some games, a TV/DVD player, CD player, binoculars, and the extras were there as well. The kitchen included a dishwasher and granite countertops, so it was the best rustic north shore setting and feel with the modern comforts of home! I didn't work directly with anyone from Cascade, but the emails I received were adequate. We absolutely love this cabin! The sitting area with the view of the lake is a highlight: we love sitting and reading or eating lunch here while watching the waves come in. The kitchen appliances are top notch and make preparing meals a breeze and the in-floor heat is welcome on cold mornings. Being in close proximity to many state parts and hiking trails is a real positive and we love that Grand Marais is a short drive away. We will absolutely come back again! First of all I'd like to say that we love this home! We love the huge outdoor deck, the fenced in yard, the wonderful fire pit along with MANY, MANY other things. We have been renting the place at minimum yearly for the last 6 years. During our last several visits we had noticed that home had not been kept up quite as well as it had been previously. We contacted Cascade Vacation Rentals and made our concerns known. When we arrived this year we were MORE than pleasantly surprised to see that almost every issue had been addressed. The kitchen chairs had been replaced (and it is WAAAAAY better than before - you can actually walk behind someone who is already sitting down), the smelly bathroom towels had been replaced, the old sheets had been replaced, the lawn had been mowed, everything was just wonderful! We really appreciated that our concerns were not only heard but also dealt with. Usually, we have had amazing weather allowing us to be outside from morning until bedtime. This year we were not as lucky with the weather, so it was fantastic that the kitchen chairs were now usable since we spent every evening there playing board games and playing spades. It made a HUGE difference. Thank you so much! Our stay was absolutely fantastic!! This was our fourth time in this house. It works very well for us. Location is ideal. Agate Beach is a little piece of heaven. 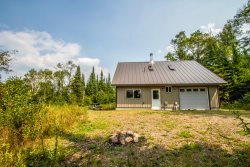 The cabin is cozy and well furnished with little touches that delight and amuse; the view of the shore and lake is spectacular; and the owners are very thoughtful and welcoming. Superior Reflections 3 is a cute, spacious cabin surrounded by woods, about a 3-minute walk down to a really nice pebble beach. I personally thought that the house was a good size, with two bedrooms, and even space to sleep someone on the couch, and a nice layout. My travel partner was not impressed with the lack of privacy in the cabin, due to the walls separating the bedrooms not reaching the ceiling. This did make sound travel, but for a short stay, I don't personally have an issue with this. The rental company was really great to provide a water cooler, as the mineral heavy waters in this area of the North Shore make it taste very salty. We took advantage of this a lot throughout the stay. No direct interaction, but email communication was frequent, informative and always timely. This cabin and location are both magical!! The cabin itself is not fancy, but it was perfect for the two of us and the Naniboujou inspired decor was beautiful. The location is the real reason to stay. Right on the water, the constant sound of the lake was so relaxing. We loved sitting on the deck watching the waves crash and watching the bald eagle that lives in the tree just down the shore do his fishing. Loved it!!!!!!! Perhaps some better towels could be provided. The location, privacy, beauty, cleanliness were perfect. Didn't have any contact per say.